Having had a number of unfortunate encounters with the stinging end of a bee in my childhood years, I’ve never particularly warmed to the critters. The ensuing death of the bee, post the sting-fest was also not much of a consolation, especially as I’m prone to oedemic reactions to the bites. That bees are vital to the food we eat was something drilled into us as children – the pollination story in short. Cucumbers, apples, almonds, cherries, grapes, peanuts, sunflowers, cauliflower, broccoli, onions and strawberries are a few– there is a vast list of crops that bees pollinate. I suspect that many people may feel the same irritation I do, or even a fear of bees, due to bites and worse – life-threatening allergies, caused by the apitoxin or bee venom in the stings. 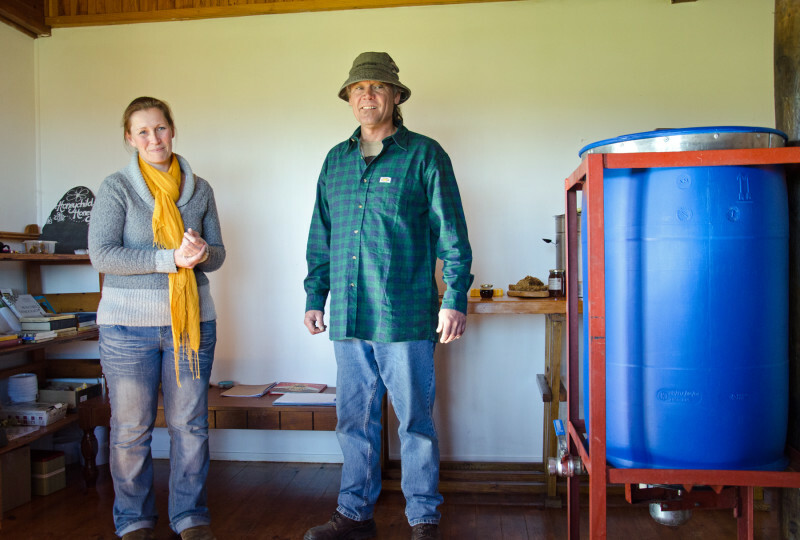 On a recent visit to beekeepers and lifelong bee lovers Owen Williams and Meagan Vermaas of Honeychild in Rheenendal, not far from Knysna, my prejudices are challenged. Both Owen and Meagan were enamoured with bees as children and left a corporate life in Cape Town 11 years ago to start Honeychild, out in the countryside. They do get bitten from time to time I find out, but with antihistamines and a natural salve, it doesn’t seem to bother them much these days. Relieved to hear that, I don on a beekeeper’s jacket and hood, and join them out at a hive, with the hum of bees close to my face. I find I have no inclination to stay too long, or sudden longing to tend hives, though patches of prose from Sue Monk Kidd’s novel, The Secret Life of Bees do run through my head for a moment. “The bees come first,” Owen and Meagan assert, referring to their hives and the feral swarms that they help to relocate. As makers of high-quality artisanal raw honey, and educators – they regularly train hobby and serious beekeepers, bee conservation is at the heart of their practice. Many of the people who attend their courses hire them first to perform “humane” bee removals at their properties and are drawn to the process. Some of their students have gone on to produce award-wining honey. Globally, beekeepers and crop farmers have several issues to be concerned about. The problems with the honey bees are many-fold. Foremost is the rapidly dwindling numbers of bees and resultant empty hives. In the U.S around one-third of bee colonies have died or disappeared – a phenomenon called Colony Collapse Disorder (CCD) seems to be at the core. In areas of China where the bees have departed altogether, pollination must be performed by hand, using paintbrushes. According to the South African Bee Journal, the latest losses in South Africa are recorded at 28 percent. Mike Allsopp, a senior researcher at the Plant Protection Research Institute in Stellenbosch, says that there isn’t enough evidence that CCD is a problem locally. However, he states that there is reason to fear that our local bees are not as healthy and viable as they were, and that if left untreated, we could also suffer dramatic losses in honeybee numbers. Diseases caused by pesticides and pests as well as the lack of food or “forage” for bees, are problems in the South African landscape. 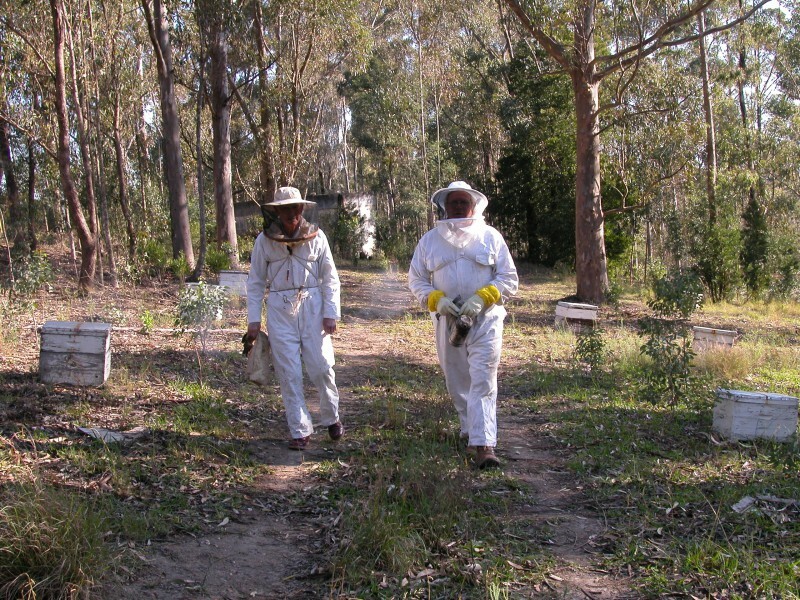 “The biggest problem is a shortage of suitable bee forage, which is exacerbated by land development and the removal of Eucalyptus trees which honeybees feed on. Extreme levels of theft and vandalism and very little government support, in terms of research and development, extension, or the control of pests and diseases are our issues” Mike explains. 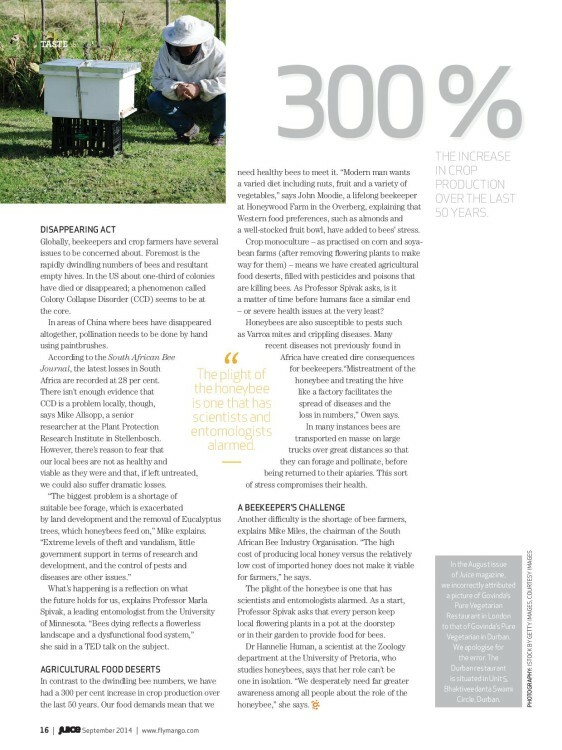 In contrast to the dwindling bee numbers, we have had a 300 percent increase in crop production requiring the bee’s pollination services over the last 50 years. Our food demands impose that we need healthy bees in order to meet it. 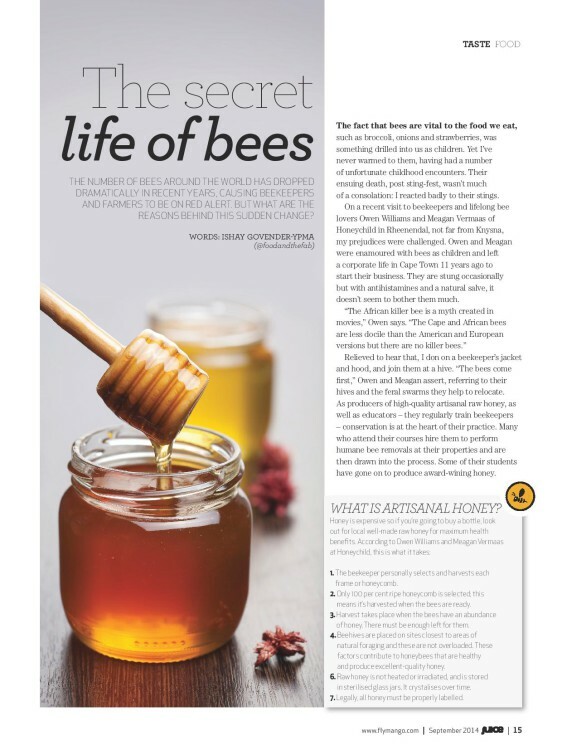 “Modern man wants a varied diet including nuts, fruit and a variety of vegetables,” says John Moodie a lifelong beekeeper at Honeywood Farm in the Overberg, explaining that Western food preferences, such as almonds and a well-stocked fruit bowl have added to the bee’s stress. Crop monoculture – corn and soya bean farms, and removing flowering plants to make way for them means we have created agricultural food deserts, filled with pesticides and poisons that are killing bees. As Professor Spivak says, is it a matter of time before humans face a similar end, or severe health issues at the very least? Honeybees are also susceptible to pests such as Varroa mites, and crippling diseases – the causes of bee losses are thus multiple, and interacting. John explains that many recent diseases not previously found in Africa such as the American foulbrood have infiltrated, creating dire consequences for beekeepers. “Mistreatment of the honeybee and treating the hive like a factory facilitates the spread of diseases and the loss in numbers,” Owen says. In many instances bees are transported en masse atop large trucks over great distances so that they can forage and pollinate, before being returned to their apiaries. This sort of stress compromises their health. Mike Miles, the chairman of the South African Bee Industry Organisation (SABIO) explains another challenge is the shortage of bee farmers. High costs and low returns are the primary factor. “The high cost of producing local honey versus the relatively low cost of imported honey does not make it very viable for the honeybee farmer,” he says. The plight of the honeybee is one that has scientists and entomologists alarmed. Professor Spivak asks that every person plant local flowering plants in a pot at the doorstep, or in the garden to provide food for the bee as a start. What is artisanal or “boutique” honey? 6. Raw honey is not heated or irradiated, and stored in sterilised glass jars. It crystalises over time. 7. Legally, all honey must be properly labeled.